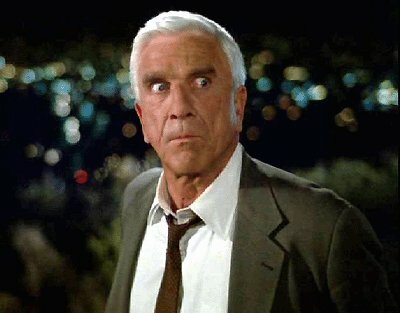 Canadian actor Leslie Nielsen best known as Sergeant Frank Drebin, Detective Lieutenant Police Squad has died aged 84 near his home in Florida. At 17 Nielsen trained as an aerial gunner with the Royal Canadian Air Force but was too young to be sent in to WWII. After a stint as a DJ, he attended the Lorne Greene Academy of Radio Arts in Toronto and The Actor's Studio in New York before being cast in The Vagabond King in 1956. 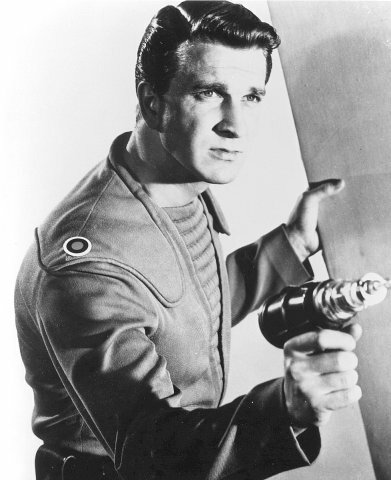 His second movie released in the same year is one of the most beloved science fiction movies of all time, Fred M. Wilcox's Forbidden Planet. In Forbidden Planet [a movie that lent quite a few ideas to Star Trek] Nielsen portrayed Commander John J. Adams of the United Planets Cruiser C-57D and made his name as a serious actor here and dozens of movies like The Poseidon Adventure and TV roles including Hawaii 5-0. The world of comedy was forever changed by Jim Abrahams and David and Jerry Zucker in 1980 when they created Airplane! to spoof Zero Hour and Airport. The visionary directors chose Neilsen as Dr. Rumack who delivered cold dead-pan hilarious dialogue like the iconic answer to "Surely you can't be serious? ", which is "I am serious. And don't call me Shirley." [Now #79 in The American Film Institute's "100 Years... 100 Quotes"] . When Abrahams and the Zuckers brought their new brand of comedy to Television in the form of Police Squad! to spoof cop shows like those of Quinn Martin, it was a no-brainer to cast Nielsen as the hapless Frank Drebin. Neilsen reprised his role in the extremely successful The Naked Gun trilogy of movies between 1988 and 1994. "...and where the hell was I?" Neilsen never really returned to serious acting, seeming to relish instead in the world of comedy. He appeared in a number of spoof comedies including Spy Hard, Wrongfully Accused and the Scary Movie series none of which were as well received as his previous efforts. He did many commercials in his later years as well as voices for children's shows,. He appeared on celebrity game shows and performed Darrow a one-man theatre show. He was working right up until his death and was due to lend his voice to the animated The Waterman Movie in 2011. His final movie appears to be Bill Corcoran's Stonerville which wrapped recently. My favourite is the Police Squad where Drebin is undercover as a locksmith and you see him at the door of the shop in the middle of a city turning away a customer with an ox on the end of a rope inquiring for an "oxsmith", by pointing at this shop sign "No, Locksmith,... LOCKsmith." Get's me every time. It's sad he's gone but the material he's left us will make us laugh forever. I remember when he captained United Planets Cruiser C-57 to the planet Altair IV 16 lightyears from Earth. Happy Days. That's United Planets Cruiser C-57D!!! Get it right man"
The C-57 is a WWII transport plane! Colonel riding herd on details is a job for a mere clerk, I am a big picture man.